Reliable two-way communication AXIS A8004-VE Network Video Door Station is an open, non-proprietary IP-based door station for two-way communication. identification and remote entry control. It will provide amazing possibilities to secure your business, a perfect complement to any surveillance installation AXIS A8004-VE Network Video Door Station is a robust outdoor unit with a high performing intercom function providing clear, uninterrupted an echo-free speech also in the most demanding situations. 24/7 identification of visitors and remote entry The unit includes a HDTV camera with WDR and excellent low-light performance offering reliable 24/7 identification. The product connects to existing IP network and the use of Power over Ethernet allows for installation with one single network cable, providing enough power to also support standard door-locks to enable remote entry from a mobile device or a PC. Flexible remote entry AXIS A8004 has an open interface for third-party software, allowing the unit to be integrated with video management software provided by Axis partners. To meet the requirements for small- to mid-sized installations it supports AXIS Camera Station and operation from mobile applications. SIP Support for integration with IP Phone systems The unit supports Session Initiation Protocol (SIP) for easy integration with various IP phone systems to meet advanced audio and video communication needs. AXIS A8004-VE is equipped with multiple inputs and outputs for remote control of door locks as well as other equipment. Small and convenient AXIS A8105-E fits where you want it to go - on walls, doorframes and mullions. A flush mounting accessory enables recessed mounting in walls. AXIS A8105-E also features Axis' Digital Corridor Format, which makes it easy to adjust the viewing area to the location and increase the vertical area of view. Factory focus and support for PoE make installation fast and flexible, keeping costs low. 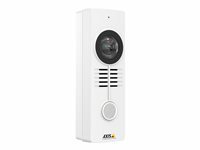 Keep your premises secure With AXIS A8105-E you get clear communication, high-quality video surveillance, and convenient remote entry control all in a single unit. You can see, talk to, identify, and then open the door to visitors directly or remotely from wherever you are. You can use your cell phone, IP phone or Video Management System (VMS) to do it. Keep your premises secure HDTV 1080p resolution and WDR - Forensic Capture deliver uncompromised visual identification even with strong backlighting - and LED lights provide enough light for you to see visitors at night. Axis' Zipstream technology significantly reduces bandwidth and storage requirements without compromising image quality. Acoustic echo cancellation and noise suppression make voices audible regardless of background noise thanks to uncompromised full duplex audio. 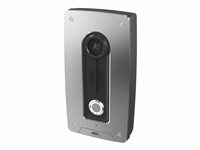 A powerful surveillance solution AXIS A8105-E doesn't just let you identify and control who enters your premises, it connects to your system just like any other surveillance camera and records what's happening outside your door. Integrated video analytics, such as AXIS Video Motion Detection, alert you of threatening events or vandalism so you can call for help - and you'll have a visual record of the incidents.